Discover our guide to 18 beautiful Naxos beaches. They are all presented with detailed description, photos and their location on a map of Naxos. For the most popular spots, we also provide information about sightseeing in the area, a selection of hotels and reviews. 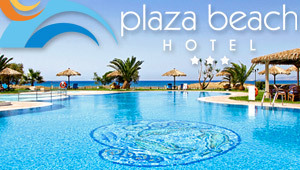 Description: The famous Plaka Beach is a long, sprawling, strip of white sand with sand dunes behind the beach. It is one of the most beautiful beaches of Naxos island. Here you can enjoy the lovely water, a view of Paros and some space. Description: Agios Prokopios is one of the most beautiful beaches of the island. This is a long, golden beach with many watersports and surrounded by plenty of tourist facilities. Description: Mikri Vigla is one of the most famous windsurfing spots in Naxos. The wind is perfect for windsurfing and kitesurfing and many watersports centre line this beach. Description: Orkos is a beautiful beach next to Plaka. With soft sand and green ambience, Orkos attracts many visitors every summer. Description: There are many coves both sides of Aliko beach and the sea is crystal clear. The unique cedar forest with the sand dunes all over the area create a really exotic environment. Description: Maragas is an endless, picturesque beach with soft sand and crystal water. Although it is close to Chora and the popular beach resorts of Naxos, Maragas is calmer than the other beaches in the area. Description: Pyrgaki is a golden beach on the southern of the island. It is very beautiful and calmer than other beaches on the island. Description: Kastraki is a very beautiful beach on the southern side of the island. It has crystal water and a rocky ambience. Surprisingly, it usually doesn't get much popular. Description: In the continuation of Mikri Vigla, the beach of Sahara is located just behind. It is a large, calm beach with golden sand and clean water.